The answer to the question that most Penn Manor students were wondering. At the beginning of second block Friday, students and staff were notified by an announcement to go into a modified lock down. Teachers were to lock the doors and open the blinds. For students and staff it was unexpected and teachers were not made aware of the upcoming drug search. Officers from Southern Regional Police Department and their canine unit searched the high school for evidence of contraband. Teachers received an e-mail at 10:05 a.m. informing them of a random drug search, also at that time Penn Manor School District’s website had a banner describing that a drug search was going on and that students were not in any danger. 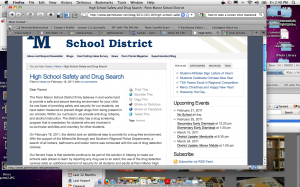 The district website described the drug search. This drug search was free of cost and it was the first time Penn Manor participated in a random search, according to Principal Philip Gale. With the support of the Millersville Borough and Southern Regional Police Departments, a search of all lockers, bathrooms and locker rooms was conducted with the use of the drug-detection canines. The school administration made an announcement saying the hope is that students continue to be part of the solution in helping to make schools safe places to learn by reporting any drug use to an adult. The use of the drug detection canines adds an additional element of security for all students and adults at Penn Manor High School according to the letter that was sent home with the students. When dogs detected specific areas in the school, they were marked to be further investigated. After the search was completed and the canines left, administrators searched the marked areas. No lockers were opened while the police or canines were still in the school. Several lockers were detected, about a dozen students were called out of class to watch their locker get searched, according to Gale. There were at least two administrators who searched each locker, along with the student, if a student occupied the locker. The areas that were most frequently hit (indicated by the dog) were water fountains and door handles. These areas are commonly touched during the school day and traces of substances could be left on them. 2. Keeping the school a safe environment. 3. Southern Regional police are a part of our school district so we wanted to work with them.